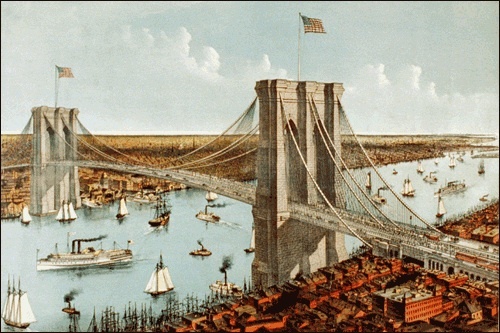 When the Brooklyn Bridge opened in May 1883, it gained fame for its beauty and accessibility. And not long after that, it became known for its jumpers. The first person to leap from the bridge was Robert Odlum, a 34-year-old swimming instructor. 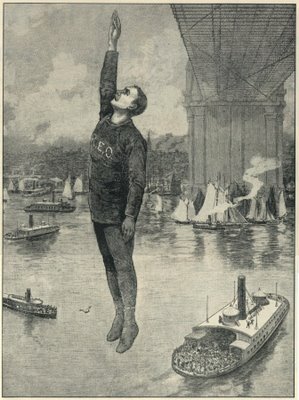 On the afternoon of May 19, 1885, after going to church, he assembled an audience: a tugboat full of spectators in the East River, as well as a rescue swimmer waiting below to help him onto the boat after he hit the water. Around 5:30, with the bridge packed with pedestrians strolling the walkways, Odlum climbed over the rail and took his plunge. “To lower the impact, he held one arm above his head and the other pressed to his side,” writes G.S. Prentzas in The Brooklyn Bridge. Did he survive? Initially, yes. He rose to the water’s surface motionless, and another man on the tugboat swam out to get him and bring him on board. But his insides were lacerated, and he died that evening. Why he did it is kind of a mystery. Some sources say it was just a daredevil stunt, others that he was after fame and fortune. He did become famous—and ever since, others have taken the same leap into the East River, with mixed results.